The National Twilight Sleep Association was formed in order to support the use of a new maternal anethesiac development begun by a young obstetrical doctor by the name of Carl Gauss. Around 1900, Gauss combined two drugs that had been in the medical armament for a long time to treat childbirth pain. One main component was morphine, used to alleviate pain during surgery. It had, thus far, been avoided in obstetrics because of its effect on the uterus, its effect on the newborn, and its effects on bleeding and infection. The other drug was scopolamine, which causes amnesia - in the past, these had been used as poisons in high doses. Hamlet's father was killed by one of scopolamine's cousins. Gauss mixed these two drugs and administered them in 'small doses' to his patients - the morphine provided relief from pain while the scopolamine provided the women with amnesia of their labors and what was done to them. The problems? Oh, there are many!!! Scopolamine caused women to lose their inhibitions. They would have no memory of what went on, nor did they realize what was happening, so most of them screamed during labor. They became uninhibited and psychotic. They would thrash about on the bed, causing injuries to their heads. So, their heads were wrapped with blankets or towels, turban-like. 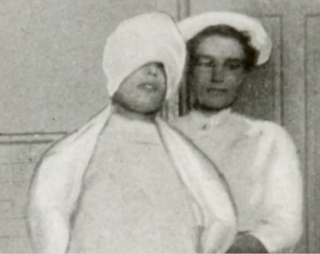 They would attempt to claw at the walls or their medical providers, so they were put in straight jackets or their wrists were strapped to the beds. Then, so that they would not fall out of bed, they were put in 'labor cribs' - and were allowed to labor, screaming, tied down, blinded and bound - often in their own urine and feces, and sometimes for days on end, until it was time to birth. The women had no memory of this, the husbands were not allowed in to see their wives, so they didn't know what was happening - and everyone was happy. Gausses concoction was tried out first in Europe and was found to be less than satisfactory for maternal care. It would probably have died out there had it not been for an infamous article in McClure's magazine. Two female reporter's who were also staunch feminists, accompanied their friend to Germany, where she was traveling to be 'treated by Dr. Gauss'. The woman was administered Twilight Sleep and was ecstatic with it. She simply woke to a baby - with no memory of the labor or birth. The three women decided to liberate American women through Twilight Sleep. Every woman wanted to have that type of birth. Medical research was not sought as to the safety, and feminist drive demanded quick results. So - the U.S. because predominantly a Twilight nation between the years of 1914-1945 (although my grandmother recounts her story of TS in 1956 and there are reports as late as the 1980's).